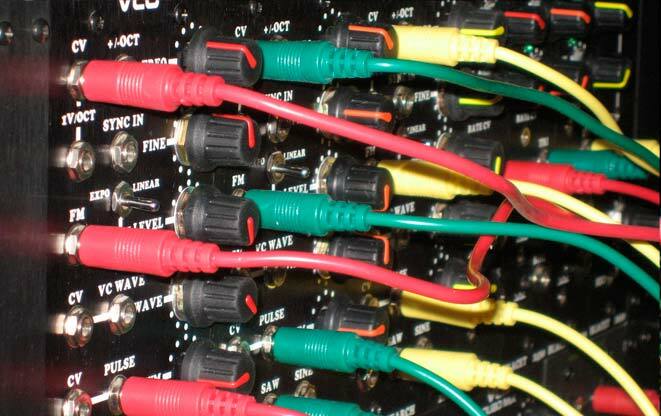 Your Home for the Best High Quality Synthesizer Patch Cables and Accessories. Alex Iles was born in 1960. Alex currently lives in Austin, Texas. Before that, Alex lived in Manhattan, KS from 1985 to 1991. After that Alex moved to Austin, Texas in 1991. Alex Iles: Electronics and control designer, systems architect, envelope design and construction. Alex was a founding member of The Robot Group, and served as president for 10 years. Alex has a background in Electrical and Computer Engineering and is currently employed by Tracking Point and Ad Infinitum. Alex was very instrumental in the computer control systems of many of The Robot Group projects. His contributions have been invaluable to the exhibit controller board, the blimps as well as the Big Rock Robotic Tower. This robot is fitted with an exhibit controller board that operate a series of hobby servo motors that move the lips, eyeballs and neck areas. A sound synthesizer provides the computer voice simulated speech that bring the Babbling Robot Head to life. Alex Iles was very instrumental in developing and programming the exhibit controller for this piece. Alex has a vision for a perpetual motion kinetic sculpture that would construct and de-construct itself. Fooles, Adjuster Fusion, Oh Man Yeah, Combo Yo Mambo, Magnanimous Cocksuckers, Manic Flagellants, the Soviets, Formless Unknowable, and Bicycle Day.